Do lost cities get social media pages when they are discovered so archaeologists can check-in? Nina and Eddie are again inexplicably searching for the lost relics of myth and legend. This time King Solomon’s lost treasures – which have previously not turned up, because reasons – are the McGuffins that could fall into the wrong hands. What could possibly go wrong with a post-Brexit rogue MI6 (SIS) spy and a Congolese warlord hot on your tail? It has been a while since I’ve read a Nina Wilde and Eddie Chase adventure. The last Andy McDermott novel I read was the excellent Persona Protocol. Slipping back into the cozy comfort of a Nina and Eddie novel wasn’t just welcoming but reminded me I’ve missed this. Implausible and over-the-top is something very few authors manage to keep interesting, but Andy does it with ease. 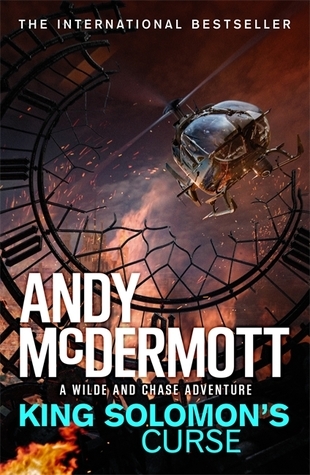 I hope Andy doesn’t start phoning these Artefact McGuffin Adventures in, I’m looking forward to reading more. Next Next post: Book vs Movie: Silence of the Lambs – What’s the Difference?